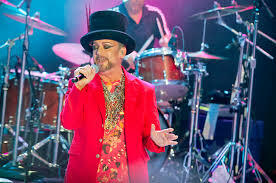 If you missed Boy George and his Culture Club band at the Mountain Winery this year, then I can honestly, say you missed one heck of a show. Drummer Jon Moss took to the stage to get the evening started at the Mountain Winery. Sitting behind a plexiglass wall on drums he got the crowd on their feet with the Club’s trademark beat of “Church of the Poison Mind” … I don’t think anyone in the venue sat down the entire evening. 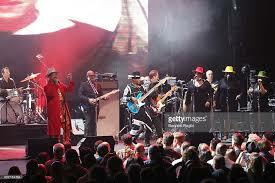 As the beat got louder and louder each of the band members followed on stage. 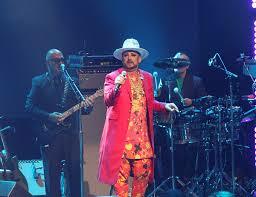 Making his grand entrance, Boy George comes out with his multi colored flamboyant suit. I’m sure some fans may have come out to do a little reminiscing – if so they were not disappointed. Lead guitarist Roy Hay turned in some great keyboard back up with the 1983 hit “Victims.” George has some great back up with three female vocalists. Lead guitarist Roy Hay and bass player Mikey Craig were sensational themselves. 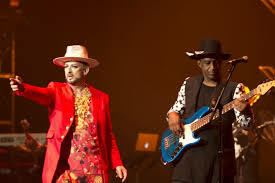 In my years of concert going, I’ve never had the opportunity until now night to see Boy George and Culture Club live. I’ve heard their songs a thousand times on my IPod. I’ve performed them at hundreds of gigs. I don’t know if I’ll ever have the opportunity to see them live again. It was a night of simply great 80’s pop at its best! 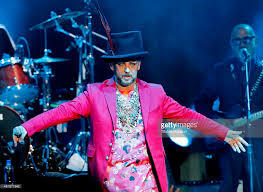 Songs like I’ll Tumble 4 Ya, Do You Really Want to Hurt Me and of course Karma Chameleon … they will be around for years to come.